If I was to present to you a worship EP from a large church in the Sydney area, you would think Hillsong right? Ah, but there is more than one church in Sydney that has the gift of music to offer the world. 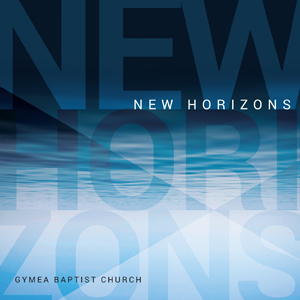 May I introduce you to Gymea Baptist Church and their worship EP New Horizons. New Horizons - the church's first recording project since 1984 - offers five new contemporary home-grown congregational worship songs of genuine quality that have been created to bless, encourage and inspire worship leaders around the world. Yes, it’s an ambitious goal considering our leviathan brothers at Hillsong, yet it is already coming to pass with churches around the world downloading the free lyrics and chord charts from their web site. The EP starts strongly with Whatever It Takes, a catchy, rocky, pulsating song of praise offerings our services to God - wherever He takes us. From here, New Horizons really takes off into the stratosphere with You Won’t Let Go, Waterfalls, and Count As Loss. These songs are deeply stirring with each song better than the last. They form a worship progression that is equal to any in the world in terms of lyrical content, song writing and, most importantly, spiritual engagement. The anthem-like title track New Horizons closes out the EP perfectly. In terms of musical style, New Horizons is more ‘Hillsong’ than ‘Bethel’ with big choirs, and sitting closer to ‘contemporary’ end of the scale rather than the ‘alternative’ end. I was genuinely delighted by this release. It is worthy of airplay on Christian radio around the world and I am so grateful that Gymea Baptist church took the risk to produce this EP and look forward to seeing this ministry grow. I highly recommend this EP to all worship leaders - especially due to the free transcript downloads.